Yesterday evening we heard the first official report that delivered some details about what scientific areas the BRAIN Initiative (at least the part coordinated by the National Institutes of Health) will focus on and what its general approach to science funding will be. Cori Bargmann and Bill Newsome (co-chairs of the NIH-appointed panel that is advising the NIH-director about the plan) spoke through a webcasted seminar to explain the conclusions that arose from the series of scientific workshops and meetings that have been taking place over the summer to discuss what could be the scientific priorities of the BRAIN Initiative. These priorities will set the ground of the research areas to be funded by the BRAIN initiative NIH funding in Fiscal Year 2014 (with a budget of US $40M). The overall goal of the project was summarized as focusing of developing tools and resources for analyzing neuronal circuits and their function in living organisms. The two scientists delved on a number of principles that applied to the overall initiative, such as promoting platforms for data sharing, promoting interdisciplinary research and focusing on a variety of experimental organisms and studies across temporal and spatial scales. Generate a census of cell types in the nervous system. Including neurons and glia and techniques for targeting them. To be attempted in parallel in human and animal samples. Methods developed for this should apply across species. 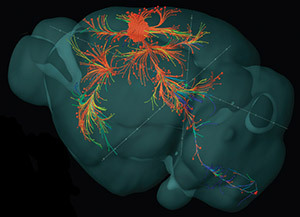 Create structural maps of the brain. This means cell to cell level connections in different animal models. This would complement the Human Connectome project (based on macroscale neuroimaging approaches). Develop new large scale methods for recording chemical and electrical activity of neurons. Scaling up of electrophysiological and imaging methods as well as completely new technologies. Develop a suite of tools for circuit manipulation and perturbation of circuit function. A push for the development of technologies like optogenetics that enable manipulating nervous activity in ways that resemble natural activity patterns. Linking brain activity to behavior. Activity monitoring at the same time that behavior is monitored. Highlighting the importance of making simultaneous measurements during long periods of time and during different types of behaviors. Integrating theory, statistics and computation with experimentation. Importance of theoretical frameworks that could explain principles of brain function. Delineate mechanisms underlying macroscale brain imaging technologies, as used in humans. Create mechanisms to enable collection of human data. Provide training so that new methods reach the community and promoting interdisciplinary research. Although these FY2014 research priorities are presented as 9 independent entities, the goal is really to integrate these approaches as much as possible —but how exactly this integration will take place or be promoted is to be revealed by June 2014. The goals are also highly ambitious and will require much more funding than the BRAIN Intiative’s current budget. The speakers noted that the goals were not “to develop tools for tools sake” but tools that could have applicability. Innovative tools, thoroughly validated and applied in real nervous systems, improved through iterations and to ensure that they are disseminated efficiently to the community. The commission also highlighted that their goal was not to deliver the solutions but the problems. Solutions to addressing these challenges are to come from ‘bottom-up’ approaches proposed by the community of scientists. Tools for studying individual cells in the brain or the entire brain as a whole exist and continue to be very useful. But methods for understanding how connected networks of cells in the brain work and relate to behavior are still largely missing. Even maps of these connected entities remain unknown. Focusing funding on better tools to close this gap will be exciting and productive for advancing neuroscience as a whole. The conclusions disclosed in this interim report are very much in line with what was expected of the project as announced a few months ago. They also largely agree with the main scientific goals that were deemed to be the top funding priorities for the National Science Foundation for the BRAIN Initiative (which will have US$20M to contribute, as well). Indeed, many of the topics covered in these 9 areas were things we and others discussed in editorials and commentaries related to the BRAIN Initiative in our pages and in this blog. The working group that has developed these priorities has had an inclusive, overarching frame of mind and included most of the major challenges that neuroscience currently faces, as most scientists would probably agree. As we’ve said before, a push for technology development in neuroscience, with clear goals and challenges that these tools need to tackle, will surely be an efficient way of advancing the science of the brain.